Facing a growing rebellion within his own ranks, House Speaker Paul Ryan pulled the Republican Obamacare replacement plan from the House floor on Friday just before a scheduled vote. 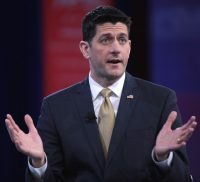 The decision is a staggering defeat for Ryan and President Donald Trump in their first attempt to partner on major legislation and fulfill a seven-year Republican promise to repeal Obamacare. It comes a day after Trump issued an ultimatum to House Republicans to vote for the bill or live with Obamacare.